It is truly heart-warming to observe how enchanted kids are after meeting our resident Pacific Bottlenose Dolphins. At our state of the art marine mammal facility in Nuevo Vallarta, just north of Puerto Vallarta, kids can interact with these charming and intelligent cetaceans. Children, after being introduced to the mischievous inhabitants of our dolphin enclosure, will display an ever-widening grin. As soon as participants view these smooth and vivacious animals swimming swiftly through their salt-water pool, they will be entranced. Children will then enjoy an interactive experience beyond their wildest imagination on the shallow platform where they can encounter a Pacific Bottlenose. 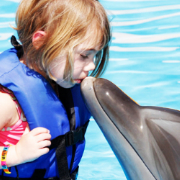 Every single child participant will have the opportunity to spend some individual quality time with a dolphin. We limit the number of participants on each of our tours in order to maximize each person’s time with these highly-trained and placid mammals. Participants can run the dolphin’s tummy, give it a huge hug, and receive an amorous dolphin smooch. Children will also find our encounters extremely educational; they will learn all about communicating with these brilliant creatures through hand gestures. They can tell the dolphins to perform eye-popping acrobatic tricks in the lagoon. Children will be educated about the tenets of behavioral training and positive reinforcement. After your family travels home from your Puerto Vallarta vacation, your children can utilize their newly learned training methods to train the family dog. If you would like your children to enjoy a lasting memory while on a family vacation in Puerto Vallarta, be sure to sign them up for one of our Dolphin Kids activities.